External Affairs Minister G.L. Peiris received a devastating snub from the Government of Nepal this week. It was over his remarks in no less a hallowed precinctthan in Parliament that Nepal's President Dr. Ram Baran Yadav had asked President Mahinda Rajapaksa to mediate in the internal political crisis in the Himalayan nation. The claim was that the request was made when the two Presidents met in Shanghai recently. The Government of Nepal has flatly denied it. For the record, here is what Dr. Peiris told Parliament on Wednesday: "I have to proudly announce that President Mahinda Rajapaksa has been accepted not only as the leader of Sri Lanka, but as a regional leader. When we were in Shanghai 12 days back, the Nepali President made a request from our President saying you have gone to the Maldives and helped to resolve their problem. "The President brought the two sides -- a six member committee -- three members each from both sides together into one room in the presence of him (President.) It was a difficult task according to the situation at that time. President Rajapaksa was able to do that. President of the Maldives Nasheed was here for the second swearing-in ceremony of the President. He clearly stated this. The Maldivian representative also clearly stated this addressing the UN sessions. "Now the Nepali President met with President Mahinda Rajapaksa in Shanghai and eagerly requested President Rajapaksa to do the same thing he did in the Maldives saying that they too had a complicated problem. He invited him to intervene to resolve the problem". Barely two days after the speech in the House, the Government of Nepal reacted, angrily. "It is a baseless claim. The President made no such request during the meeting with the Sri Lankan President, Rajendra Dahal, Press Advisor to President Dr. Ram Baran Yadav has told leading Indian media. His remarks came after they published reports quoting Dr.. Peiris's remarks in the Sri Lankan Parliament about the request for President Rajapaksa to mediate. Every media outlet in India that ran the story received the denial. Dahal has said that the Nepali Embassy in Sri Lanka has also issued a statement terming the claim as "unsubstantiated." Nepal Embassy spokesperson Suresh Adhikari, who is also the First Secretary, told the Sunday Times: "During the meeting between President Mahinda Rajapaksa and the President of Nepal no request had been made for the intervention of the Sri Lankan President to resolve any internal problem". "The newspapers (in Colombo) which carried this news item have been informed that the reports carried regarding this are inaccurate," he added. An External Affairs Ministry official n Colombo said this was the first time that a Minister responsible for the subject of foreign affairs has publicly embarrassed his own President by his utterances. In diplomatic parlance such remarks are called "terminological inexactitudes". It is a phrase introduced by Winston Churchill, before he became British Prime Minister, as a euphemism or circumlocution, meaning a lie or untruth. Nepal is a member of the South Asian Association for Regional Co-operation (SAARC). For those interested, an extract containing Minister G.L. Peiris' 'terminological inexactitude' can be listened. The latest slogan of the Traffic Police says, "No Dialling, No Texting While Driving." Some motorists, no doubt, are puzzled. They may not dial or do texting but would still answer calls they receive on their mobile phones. After all, the slogan does not prohibit answering calls. Is it an error or a deliberate loophole? It was full house last Monday when President Mahinda Rajapaksa presented the 2011 Budget, the first during his new six-year term, in Parliament. Conspicuous by his absence was his son and Hambantota district Parliamentarian Namal Rajapaksa. The talking point in UPFA circles was what kept the young Rajapaksa away. However, he did show up the next day in the House and was seen chatting with many of the Government members present. When asked about his absence, the young Rajapaksa said he had Law College examinations both last Monday and Tuesday. However, he chose to attend sittings for a while on Tuesday. He said "Otherwise people would say I am boycotting because I have not been given a portfolio." Minister Wimal Weerawansa who was nearby remarked "some might even say you were going to be the Leader of the Opposition, a post for which there is so much infighting now." A picture circulated to Sri Lankan media by Jeff Goonewardena, Sri Lanka's Consul General for Western States of United States, showed him standing next to President Barrack Obama. The caption said, "During the meeting, he (Goonewardena) had the opportunity to brief the President on the great potential for developing mutual co-operation between the two countries." Besides standing together for a photo, if Goonewardena indeed briefed President Obama, that is history. That is a feat yet to be achieved by any Sri Lankan, a leader or otherwise, during a meeting with the incumbent US President. US Embassy spokesperson Glen Davis confirmed that the picture was authentic. She however said, "Mr. Goonewardena interacted with the President for only a brief moment, as this was part of a photo line". Ms. Davis added that it was at a 'Senator Boxer' event. Sen. Barbara Boxer who has been a most progressive Democrat in the US Senate was seeking re-election and the event was held in October. Sources in California say the opportunity to be photographed with Obama was extended to anyone who made a donation of US Dollars 1,000 (about Rs. 109,000); so this was during a Democratic Party fund raising event that lasted 80 minutes. There was a large queue and a photo opportunity lasted around 30 seconds. Obama attended several of these fund raisers around the time of the mid-term Congressional elections. With the External Affairs Ministry in a sorry state, even Consul Generals representing Sri Lanka are promoting themselves more than the country. Here is one more on Sri Lanka's California-based Consul General Jeff Goonewardena. He has also been featured in a Californian newspaper after he made claims that he was honorary Mayor of Oceanside, a city in that State. "Apparently, Oceanside has gone international. We seem to be in need of advice from the Consul General of Sri Lanka. This is the same guy who owned the carwash down on Oceanside Boulevard a couple of years ago……," he said quoting one of three e-mails he had received. "There has never been an appointment of an honorary mayor by this City Council," Feller wrote. "I would appreciate knowing who inappropriately gave such a title……. I would like to see who authorized the misrepresentation……"
The second e-mail was a simple question from one Kamal Vijitha: "I would like to know if this is true. Is Mr. Jeff Goonewardena (sic) the Honorary Mayor and Adviser on Political & Trade issues to the city of Oceanside, California"
A third, labelled as a Los Angeles news release: "Welcome to Our New Consul General to Sri Lanka Consulate General in Los Angeles, Mr. Jeff Goonewardena." Goonewardena's resume follows, which cites various postings as a Consul General for Sri Lanka.
" Honorary Mayor to the city of Baton Rouge, Louisiana. " Honorary Mayor and Adviser on Political and Trade issues to the city of Oceanside, California." "Wood left out of his narrative the fact that Goonewardena was a campaign donor as well as the primary fundraiser for Wood during his 2008 re-election campaign. "That was his choice," Wood said when I brought up Goonewardena's financial support. As a postscript, you'll recall that Goonewardena's resume included another honorary mayor title, this one from Baton Rouge. "How exclusive is this honour? According to the centre's website, ‘any international visitor is encouraged to request the welcoming ceremony.’ "
At least some senior officials in the External Affairs Ministry were embarrassed over the breach of protocol during events connected with the visit to Sri Lanka by Indian External Affairs Minister S.M. Krishna. Sri Lankan External Affairs Minister G.L. 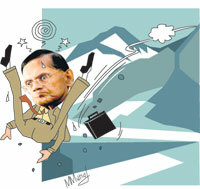 Peiris had to be at the Bandaranaike International Airport on Friday to receive Mr. Krishna. A new precedent indeed. No Sri Lankan External Affairs Ministers were received by their Indian counterparts during visits to that country. External Affairs Ministry officials say that in terms of diplomatic norms, a visiting External Affairs Minister usually met his Sri Lankan counterpart before meeting other government dignitaries. Krishna, however, called first on President Rajapaksa and thereafter held talks with Dr. Peiris. New Delhi also had its way in drafting a nine-page "minute" concerning the Sri Lanka-India Joint Commission. It was ready for signing after one of the briefest meetings of the Commission. EAM officials in Colombo say the drafting of such minutes was the responsibility of the host country. It was a non-event for the local and foreign media who were invited to cover the arrival of Indian External Affairs Minister S.M. Krishna and his entourage. The Government Department of Information had invited them to assemble at the VIP lounge in the Bandaranaike International Airport (BIA) at 4.30 p.m. on Friday for the coverage. Mr. Krishna and party were due to touch down at 4.45 p.m. in a special Indian Air Force jet. He did arrive with other Indian External Affairs Ministry officials. Immediately thereafter, he boarded a Sri Lanka Air Force helicopter for a ride to Colombo. This is whilst the local and foreign media were at the VIP lounge. Some VIP treatment, that. And some treatment for the media too. What happened to Dr. Police Chief? There was a marked change when President Mahinda Rajapaksa took his oaths for a second term from a special dais at the top of the steps leading to the Presidential Secretariat, the former Parliament building. Flanking him from behind were only the Commanders of the Army (Lt. Gen. Jagath Jayasuriya), Navy (Admiral Thisara Samarasinghe) and Air Force (Air Marshal Roshan Gunathileke). Police Chief, Dr. Mahinda Balasuriya was a notable absentee. On previous occasions, the Police Chief was also present. A Defence Ministry source claimed that though on some occasions Police Chiefs were present, the procedure had been a mistake. "It has now been rectified," he said. Nevertheless, Police Headquarters said that the spouse of Dr. Balasuriya was not an invitee. The spouses of the other service chiefs, however, were present on the occasion. That could not have been rectifying another anomaly, surely. The External Affairs Ministry had already sounded out its counterpart in South Korea over the appointment of Admiral Wasantha Karannagoda, former Commander of the Navy, to be Sri Lanka's envoy in that country. He was earlier scheduled to go to Britain. Now comes the news that he does not want to serve in South Korea. Instead, he has said that he would prefer another posting. In the midst of this, the External Affairs Ministry has obtained the concurrence of its counterpart in Japan for the appointment of a retired foreign service officer. He was expected to be Sri Lanka's envoy in Tokyo. The post has remained vacant for more than one year since the then serving Ambassador was recalled over an episode where then Prime Minister Ratnasiri Wickramanayake was subjected to grilling at the Narita airport co-inciding with a ceremony where some questionable Buddha relics from a temple in Ratnapura were to be sent for an exposition in Osaka. The ambassador who was on approved leave was made the fall-guy in the whole sordid saga. At present Esala Weerakoon, a career diplomat, serves as Charge d' Affaires. The friendly Japanese are scratching their heads why they are subjected to this kind of treatment nowadays. Has Sri Lanka got new friends, they might be asking. Meanwhile, efforts are being made to ascertain whether the Admiral and the retired career officer could change slots. The visiting Indian External Affairs Minister S.M. Krishna and his counterpart G.L.Peiris were set to address the joint news conference at the Ministry of External Affairs on Friday. Minister Peiris started the news conference, but TV and radio journalists shouted out that they were not receiving the audio signals needed for recording the event. Minister Peiris told his staff to rectify the matter. Both Ministers walked away from the podium. Journalists tried to place their mikes on the stand in front of the podium ahead of the Indian Minister. However, his security staff intervened and prevented it. Soon a sound set-up was brought in. Journalists were told to place their mikes in front of it. The news conference resumed, but the journalists were not too happy about the facility due to the echo. Thus, a poor quality coverage. Can't get even that right, what? Rs. 40 million for whom? They fell ill on the same day. They ended up together at the Prison Hospital. Apart from their ailments, it became a good opportunity to talk of many things. That is what former General Sarath Fonseka and his then Co-ordinating Secretary for the January Presidential elections, Senaka Haripriya Arnold de Silva (or Sha Silva) did. Fonseka, the defeated Presidential candidate is serving a sentence of 30 months rigorous imprisonment whilst de Silva is in remand custody. De Silva asked Fonseka about the Rs. 40 million given to a key player in the campaign. He said that there was no explanation as to how this money was spent. The former General nodded and added that it must be looked into. This is whilst Fonseka's backers at the Presidential polls, the United National Party (UNP) and the Janatha Vimukthi Peramuna (JVP) complain that some of the bills over election expenses still remain unsettled. Even if it was not termed the inauguration ball, like in the United States, there were similar trappings when President Mahinda Rajapaksa hosted a gala party last Monday night. There were more than 2,000 guests. However, it was different from the one he held on a previous occasion to mark Independence Day on February 4. Only fruit juice and local brews like pol-pala were served this time as beverages. On the last occasion, a few uniformed types left their batons or caps. Others boarded the wrong vehicle to head home. They had all enjoyed too much vino then. The night caller said: Go home!